It's that the time of year where we bare more skin so we want it to look it's best! The trick to achieving the softest, silkiest skin is to regularly exfoliate and then moisturize with a deep penetrating oil (this is how most celebs achieve youthful looking skin on the red carpet). Below are some of the best body scrubs and oils to get your skin in summer-ready condition. Summer-ready in Ramy Brook beach cover-up. Using the products below, I exfoliate twice weekly and never bare my arms and legs without slathering on an oil. Brown Sugar Body Polish by Fresh is a wildly popular, all-natural scrub made with real brown sugar crystals and natural humectants that rid your skin of dry skin cells while preventing future moisture loss. The scrub blends four natural oils that deeply moisturize and nourish the skin so it's like having two products in one. I have been using it for years to keep my legs from looking like alligator skin and think it's one of the best moisturizing exfoliators on the market. Nothing is sweeter than Milk and Honey--this scrub included. Made of pure Honey and Soy Milk protein, this body exfoliator helps your skin feel it’s softest. 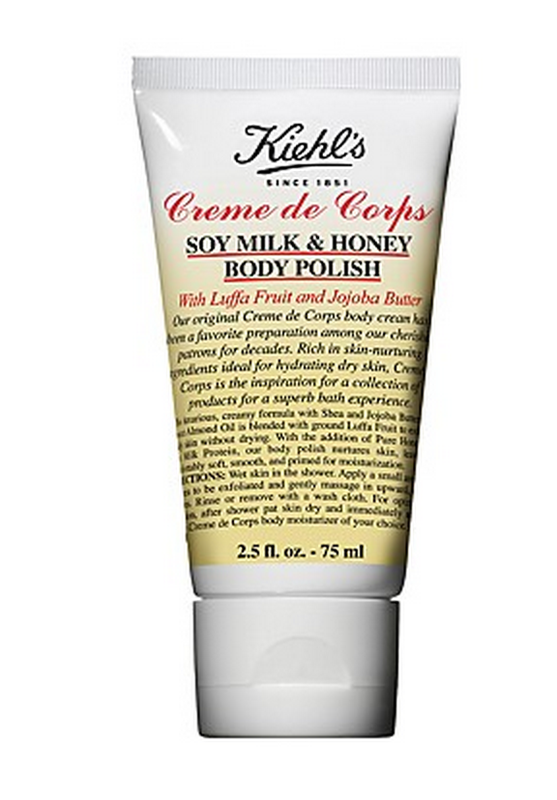 Kiehl’s body polish is also infused with Shea and Jojoba Butters, Sweet Almond Oil, and Luffa Fruit for a nourishing effect. It does not leave an oily residue on the skin so makes a great pre self-tan scrub. I am obsessed with the amazing scent! L'Occitane Verveine body scrub contains salts from the Mediterranean Sea and pure extracts of verbena, orange, geranium and lemon tree. It's also filled with natural essential oils of grapeseed, apricot and sweet almond to nourish and moisturize the skin. This scrub has a citrusy scent and is a master at massaging away dead skin cells, leaving your skin silky soft. I like to use it in the morning because it's so refreshing. Teadora in Portuguese means ADORES YOU. The body care line offers natural and organic products made with ingredients from the rainforest such as Acai, Pitanga, Andiroba, Buriti and Cupuacu. I really love their products, especially the super moisturizing oils that come in two amazing scents, Rainforest at Dusk and Rainforest at Dawn. I have been slathering them on my legs and arms before going out, using dawn in the morning and dusk in the evening! Fun Fact: Cupuaçu is the next big super fruit and is in every Teadora product. It's a strong moisturizer, rich in vitamins, anti-oxidants and essential nutrients. It also helps improve the appearance, elasticity and texture of skin. Poised to become the next big super fruit to hit the U.S., some nutritional food experts are saying that it will eclipse the popular Acai because it's healthier, has the same benefits, and is easier to grow without destroying rainforests. This 100% Pure Argan Oil is rich in vitamin E and essential fatty acids, and grown organically in Morocco. With its multitasking benefits, Argan Oil can be used for many areas including hydrating and nourishing skin, as a daily moisturizer, skin treatment, treating spilt ends, and softening cuticles. It's gentle enough to use on all skin types--I like to use it on my face, elbows, hair, and nails. Contains no parabens, sulfates, synthetic fragrances or dyes. The soothing body oil by Espa is a wonderful way to hydrate and de-stress! It's an aromatherapeutic combination of Sandalwood, Rose Geranium, Frankincense, and Myrrh that helps to unwind, quiet the mind, and lull you into a peaceful state. I like to use this oil on my chest and arms before a stressful day. Also, the warm and woodsy scent is perfect for both women and men. My husband brought this oil home for me as a gift when returning from a business trip in London--I've been addicted to it ever since!